Chastain provided Phase II design engineering services, and is currently providing Project Administration and Phase III construction observation services for the rehabilitation of the Oakley Sediment Basin and the dredging of Basins 1-4 of Lake Decatur. The Oakley Sediment Basin existing berms will be raised by ten feet; increasing the capacity of the 523 acre site that stores sediment pumped out from the lake. 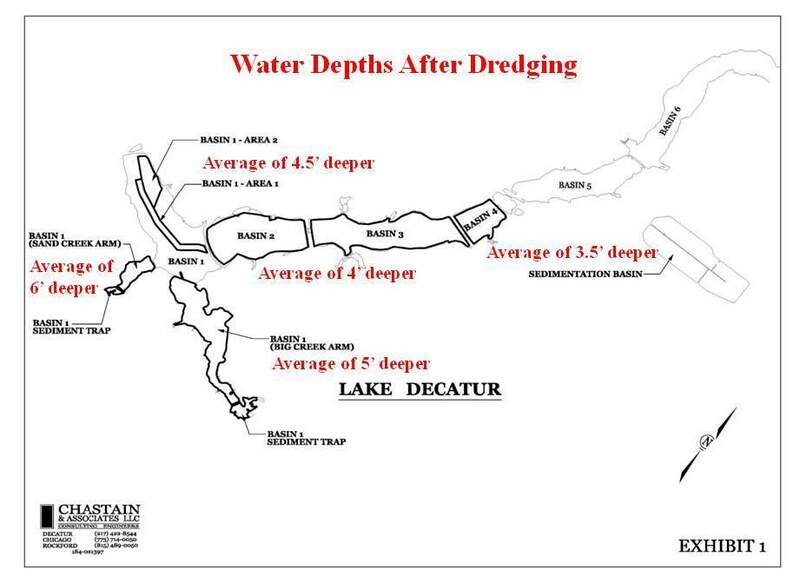 In addition, Basins 1 - 4 will be dredged; restoring roughly 30% of Lake Decatur's capacity by removing sediment that has collected on the lake bottom. These basins have not been dredged since the lake's construction in the early 1920's. The lake's current capacity is 22,452 acre feet, and this project will remove an additional 6,655 acre feet. One acre foot is the equivalent of about 326,000 gallons of material. The watershed area for Lake Decatur is 925 square miles. Chastain will monitor the monthly dredge production of the Contractor by performing hydrographic surveys of the basin utilizing a fathometer interfaced with GPS equipment. The volume of material removed during the month will be measured and will be the basis for payment to the Contractor. Chastain will perform this function on a monthly basis during the dredging process and will provide record drawings at the conclusion of the project. The estimated completion date for this improvement is in 2019 with a cost of $89.3 million.